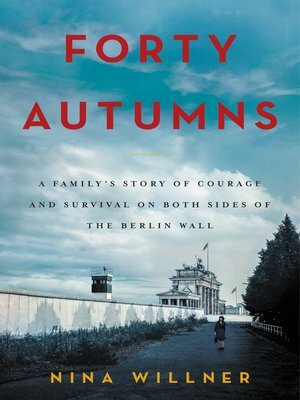 In this illuminating and deeply moving memoir, a former American military intelligence officer goes beyond traditional Cold War espionage tales to tell the true story of her family—of five women separated by the Iron Curtain for more than forty years, and their miraculous reunion after the fall of the Berlin Wall. Growing up near Washington, D.C., Hanna's daughter, Nina Willner became the first female Army Intelligence Officer to lead sensitive intelligence operations in East Berlin at the height of the Cold War. Though only a few miles separated American Nina and her German relatives—grandmother Oma, Aunt Heidi, and cousin, Cordula, a member of the East German Olympic training team—a bitter political war kept them apart. In Forty Autumns, Nina recounts her family's story—five ordinary lives buffeted by circumstances beyond their control. She takes us deep into the tumultuous and terrifying world of East Germany under Communist rule, revealing both the cruel reality her relatives endured and her own experiences as an intelligence officer, running secret operations behind the Berlin Wall that put her life at risk.